Hello friends, we meet again. Today we want to add some knowledge for you about Russia. The interesting fact about Nature in Russia. Now we want to explore more about the nature in Russia. As we know, Russia had all the nature, both eyegasm and dangerous. Have you recognize the eyegasm nature in Russia? Do you know about Russia, visit ti place in ? Lets see Top 9 Beautiful Places In Russia That Worth To See! If you says YES, now lets talk more about the dangerous one. The place yu should not approach but something you should know. To avoid visit the place you should not visit. Thats why this article was created for you. Dont you curios, right? Lets go! Now, we want you to know more about 8 Dangerous Volcanoes of Russia You Should Not Approach. Lets scrolls more. 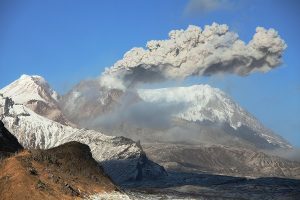 The first dangerous volcano we mention is Shiveluch which located on Kamchatka Peninsula. Why Shilevuch is on number one? Because, Shiveluch is the most active volcanoes in Russia and the mosr continue errupting in Russia. The second one is Bezymianny which also located on Kamchatka Peninsula. Bezyminanny is a stratovolcano which started as an active volcano and had an errupted in 1955. In 1956, Bezymianny was errupted. The ash was rocketed over 35 kilometers altitudes. Then a large horseshoe which can make shape crater in radius more than 1 kilometers. And another amazing explosion was happen in December 2017. These explosion had an ash plume in height about 15 kilometers. Wow! Sarychev Peak is located on Russia Far East, in Kuril Islands exactly. Sarychev Peak had 15 time explode. 15 time explode durng 1790 until 1989. In Matua Island, in the past was used as a based military both Japan and Russia. Klyucehveskaya Sopka is a stratovolcano which located in Kamchatka Peninsula, again. Klyuchevskaya is the highest mountain and the highest active volcano on Russia which had 4.754 meters of height. Klyuchevskaya had some of errupted before 2015. In 2015, Klyucehvskaya had change to stopped errupt volcano. It is happen because of the status of this volcano was change from a stratovolcano become a Strombolian effect in Klyucehvskaya itself. Scientist says that Klyuchevskaya would errupted for every five years. And when errupt was happen, it is not as easy as you heard it before. Scientist also warned everyone about this volcano. Because the acitivity in this volcanoe has been increased day by day. Karymsky which located too on Kamchatka Peninsula is the most active volcano in Kamchatka Peninsula and the most acitve volcano in Eastern zone area of Russia. Karymsky named after the ethnic group of Russia which is Karyms. Karymsky is a stratovolcano which has a symmetrical witihin rising 5 km with calder and also with Holocene. Ebeko is a highly active somma volcano which located in Kuril Islands, Russia. In 1859, Ebeko was errupted, and the errupted is the dangerous. In these erruption, there are covered sulphuric vapour. Because of that sulphuric vapour, the local inhabitants suffered from headaches and nausea. Such an amazing erruption !!! Read Also 7 Natural Wonders In Russia That Will Stun You! Again and again, most active volcano you should not approach is located in Kamchatka Peninsula. Kizimen has been errupted time by time, and recently it happen on 10 January 2013. The erruption that happen in 2013 had a 24-hour earthquake before the volcano has errupted. The earthquake happen in 31 December 2012 with 24-hour. Then, when Kizimen has been errupted in 2013 January, the ash plume over 4.200 meters altitude. Another amazing explosion was happen in 2009. The explosion ash covered almost all of Kromotsky Nature Reserve in 10 thousands kilometers altitude. Kromotsky Nature Reserve itself is the oldest in Russia. Sinarka is a stratovolcano which located in Kuril Islands. Sinarka most errupted in 17 and 18th century. Recently, geological in Russian has been note that there are an active volcano which will be errupted. One example from Sinarka’s errupted is the most destroy errupted was happen in 1872. When Sinarka was errupted in 1872, the ash and lava was destorying most of all Ainu Village. Well, we have been done explaining to you about 8 Dangerous Volcanoes of Russia You Should Not Approach. This fact will let you know more about the dangerous of volcano. Well, not very volcano is dangerous as the things above. But, if we had jump right into this fact, we will thought more about our safety when in visit in Russia. There are still a beautiful place whoch same located with these dangerous volcano, such as Kamchatka Peninsula and Kuril Islands. You, still can visit Russia, see the best place and eyegasm in Russia. Hope this article would add some knowledge more about Russia. And we hope this article would clear your mind when in thought about Russia. Russia is not just a nuclear country or communist country. There are still beauty in a beast place. Feel interesting to visit Russia?